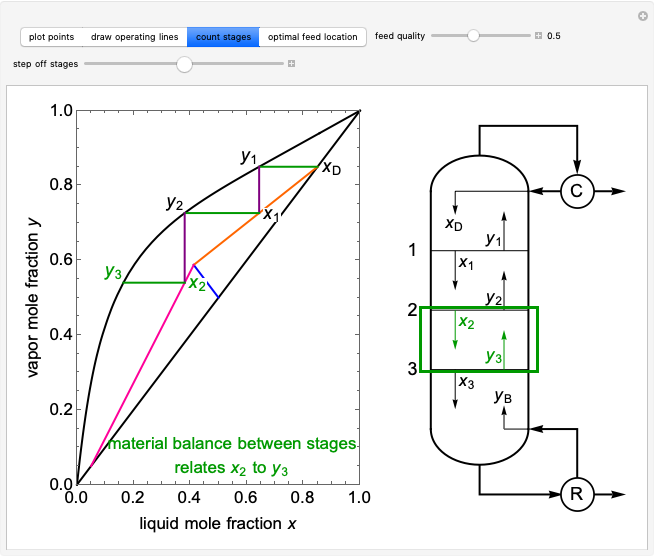 This Demonstration shows how to use the McCabe–Thiele method to determine the number of equilibrium stages needed to separate a binary mixture (methanol and water) in a distillation column. 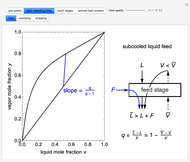 First, select "plot points" to show the location of the feed, distillate and bottoms compositions on the - diagram. 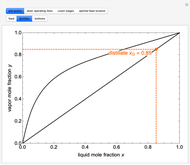 The methanol feed mole fraction is , the desired methanol mole fraction in the distillate is , and the desired methanol mole fraction in the bottoms is . Next, select "draw operating lines" to set the feed quality with a slider and plot the operating lines for the feed, rectifying and stripping sections. The diagram on the right shows a representation of part of the distillation column and explains the equations used for the operating lines. Then, select "count stages" and use the slider to step off stages and draw lines for each stage; the diagram on the right highlights the corresponding location on the column. The partial reboiler is considered an equilibrium stage. The green horizontal lines on the - diagram result from a material balance between stages. The purple vertical lines correspond to vapor-liquid equilibrium (VLE) on each stage. Finally, select "optimal feed location" to determine where the feed should enter the column; the feed should enter above the stage where the rectifying and stripping sections meet. Mouse over the stage numbers on the - diagram to see which section the numbers correspond to. where is temperature and , and are constants. where and are the Margules parameters for a methanol/water mixture. where and are the liquid and vapor flow rates in the rectifying section, is the distillate flow rate, and is the mole fraction of methanol in the distillate stream. where and are the liquid and vapor flow rates in the stripping section, is the bottoms flow rate, and is the mole fraction of methanol in the bottoms stream. where is the feed flow rate. 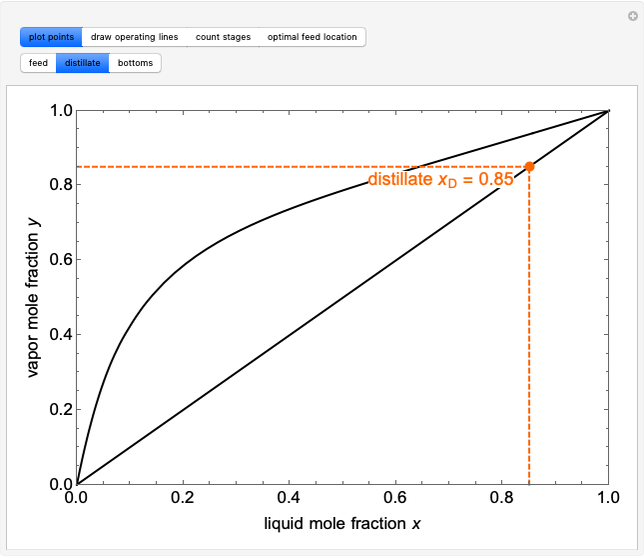 where is the mole fraction of methanol in the feed. Based on the material balance, has to be balanced with so a horizontal line (green) is drawn from on the - line to on the equilibrium curve. For the stripping section, the material balance is . 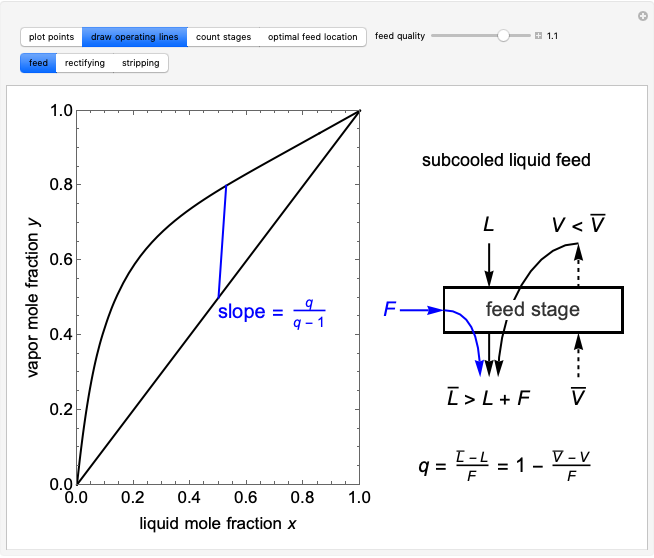 On each stage, the liquid and vapor streams are in VLE, so the stream has a liquid composition and a vapor composition . A vertical line (purple) is drawn from the equilibrium curve at to the - line at . This process is repeated until the bottoms composition is reached. Typically the number of stages drawn is not a whole number. The partial reboiler is considered an equilibrium stage. View the screencast videos [2, 3] for a step-by-step explanation of the McCabe–Thiele method. 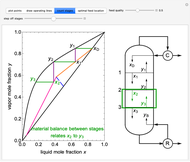 The screencast video  explains how material balances and VLE data are used to determine the number of equilibrium stages. J. D. Seader, E. J. Henley and D. K. Roper, Separation Process Principles: Chemical and Biochemical Operations, 3rd ed., Hoboken, NJ: Wiley, 2011. University of Colorado Boulder. McCabe–Thiele Graphical Method Example Part 1 [Video]. (Feb 2, 2017) www.youtube.com/watch?v=Cv4KjY2BJTA. University of Colorado Boulder. McCabe–Thiele Graphical Method Example Part 2 [Video]. (Feb 2, 2017) www.youtube.com/watch?v=eIJk5uXmBRc. University of Kentucky. McCabe–Thiele: Stepping Off Stages [Video]. (Feb 2, 2017) www.youtube.com/watch?v=rlg-ptQMAsg. Rachael L. Baumann "How to Use the McCabe-Thiele Method for Fractional Distillation"